Extra Bungee cords & a bottle of (semi-frozen) water in a fourth crate. The Lexington Whole Foods Co-op wins this title in the Buffalo area. 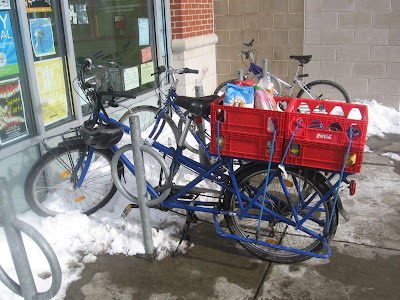 Not only do they have multiple bike racks directly next to the door...but they actually shovel them and consider them viable parking spaces (because they are). It's all too common for businesses that have bike racks not to shovel them. It's a shame that we have all these new, useful, and beautiful bike racks in the Buffalo area (read an earlier post on these by clicking here) yet many business fail to shovel them out when they shovel their walks. They just sort of sit there, protruding from a snow...sort of like monuments reminding us of fair-weather bike riding. I've never been to the Lexington Co-op when their bike racks haven't been shoveled. Things Are Not Always A Bed OF Roses On A Cargo Bike In The Winter. Arrgh! 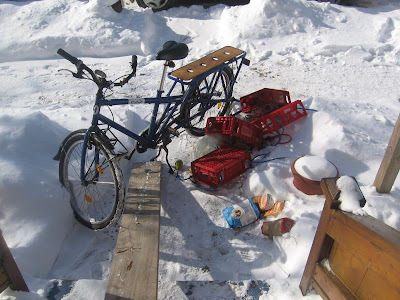 After arriving home and attempting to push the Mundo up it's plank (this is what I use to get it in the front door...the bike weighs something like 60lbs with nothing on it) I slipped on the snow causing the bike to list a little, which in turn caused the plastic crates to shift and ultimately tumble their contents into the snow before I could correct it. The worst part, I think, is that by the time I had arrived home my fruit was already frozen (the high temp today was something like 15F (-9c). Nonetheless, it was still worth it...I was able to be out in the beautiful winter sunshine on this crisp day and get a little exercise doing it. I use those ratcheting straps rather than bungees for anything remotely heavy on my Mundo, Most people use them for cars but they are great at holding a load on the mundo extremely tightly. I have in the past used straps rather than bungees for heavier loads (though I seem to have misplaced one of them) but the bungees usually work fine for these crates...the problem was that I tilted the bike. Anyhow, it taught me a lesson.